For those of who are sick of drinking coffee ― but can’t live without caffeine ― the answer is that less is always more. In five years, drinking coffee has increasingly become part of people’s lifestyle. Walking along the streets in Seoul, they are not one surprised to see a coffee shop every 50 meters. It’s not easy to find shops selling decent quality tea in Seoul, but it’s getting popular among those of who want to take some moments to enjoy “tea time” either alone or with friends. A cup of tea wakes you up as well as coffee does and it also contains flavonoids, one of the antioxidants that “slows down” aging. If you have to have a daily dose of caffeine, it is much nicer to have a cup of a healthier drink. 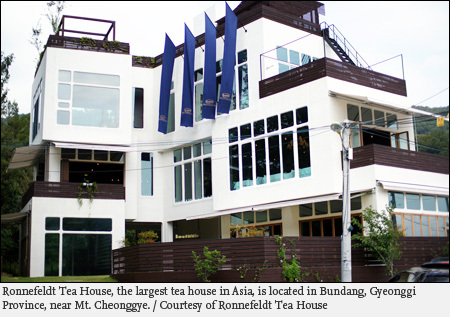 Ronnefeldt Tea House Boutique is a rare venue for the tea enthusiasts in the suburbs of Seoul. 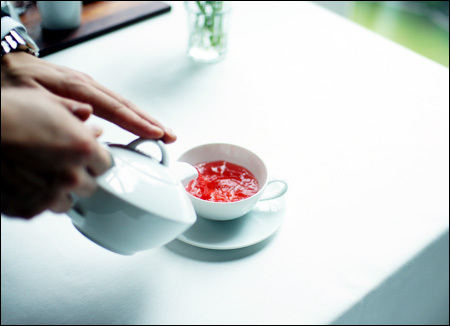 The place offers around 400 types of high quality tea from Ronnefeldt as well as fine dining using tea as an ingredient by Lee Chan-oh, the executive chef. “There is no fixed menu in the restaurant. I come up with creative ideas when I shop for fresh ingredients at a local market every morning. 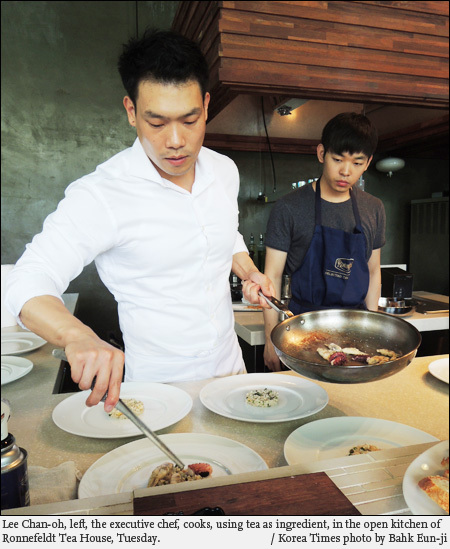 Since I use tea in the food, the menu has to go well with the scent and taste of the tea,” Lee says. Ronnefeldt Tea House is the largest tea house in Asia, located in Bundang nearby Cheonggye Mountain, where slightly aside from the bustling Seoul, visitors can fully enjoy sipping tea and natural scenery. Black tea is probably the most familiar for beginners and experts. There are two different ways to make black tea ― the orthodox method and the CTC (cut, tear, curl) method. Black tea at Ronnefeldt is made by the orthodox method, a traditional way mostly done by hand that keeps tea leaves’ natural flavor. Kim recommends several kinds of teas including black, herbal and fruit infusion teas for this season. They all look and taste differently. “Autumn is near. Now is the time for drinking tea and enjoying its fragrance,” said Kyle Kim, the CEO and tea master of Ronnefeldt Tea House. As its name of Shangrila suggests, the fragrance of the tea is fresh and sweet from blended pineapple and papaya, though the taste is crisp and dry. “Shangrila is basically the same as Assam and English breakfast tea, but is added a little bit of fruit flavor. 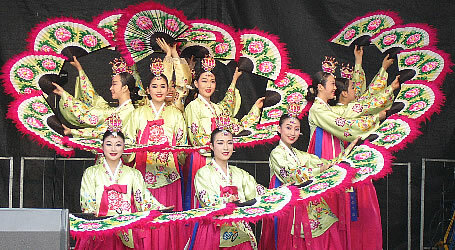 It is usually recommended to beginners who are slowly getting accustomed to strong black tea,” Kim said. Mango, pineapple and papaya are widely known as fruits from the “Garden of Eden” and the aroma of the tea is literally heaven-sent with the pieces of fruits adding to sweet flavor. “The base of Fruits of Paradise is wild honeybush, a kind of herb growing in South Africa. Honeybush is full of vitamins and minerals, so it is good for drinking at the day’s end for stress relief,” Kim said. The strong scent of mint and lemon grass hit the nose as soon as you open the lid of the tea container. Once brewed, the tea has a vivid red color, mainly because of the hibiscus. Mint and lemon grass will freshen up your mouth and your day. “Fresh Breeze makes your breath fresh. It’s perfect for those of who need some refreshment or need to stimulate their appetite,” Kim said. * Ronnefeldt is one of the most popular and time-honored tea brands among tea lovers all around the world. The German company has provided high-quality teas since 1823.